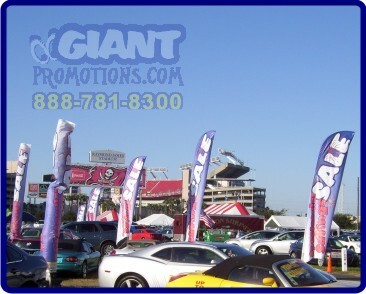 Feather Flags are an excellent low cost business marketing product. Easy to install and maintain, these colorful eyecatchers will help increase business beginning the first day. 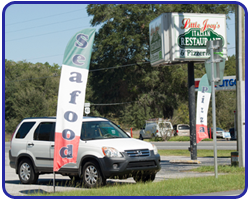 Strategically positioned next to the road or by your store, feather flags impress your business in the customer’s mind. Great for brand marketing with your company logo. Extremely economical for small businesses that want great exposure, possible uses include: Trade shows, temporary signage, short term events, marketing POS, plaza stores, automotive dealership front lines, sporting events,… you get the picture. The sky is the limit! Pack it away just as fast! 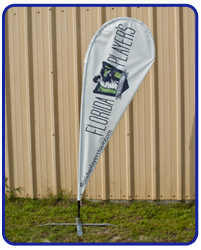 Sold as complete kits with a pole, flag and ground stake with 360 degree swivel bearing. True double sided printing – message reads correctly on both sides! Each side can have a different image! Order additional flags for changing messages. Interested in Feather Flags? Use the contact form below to contact one of our sales representatives. 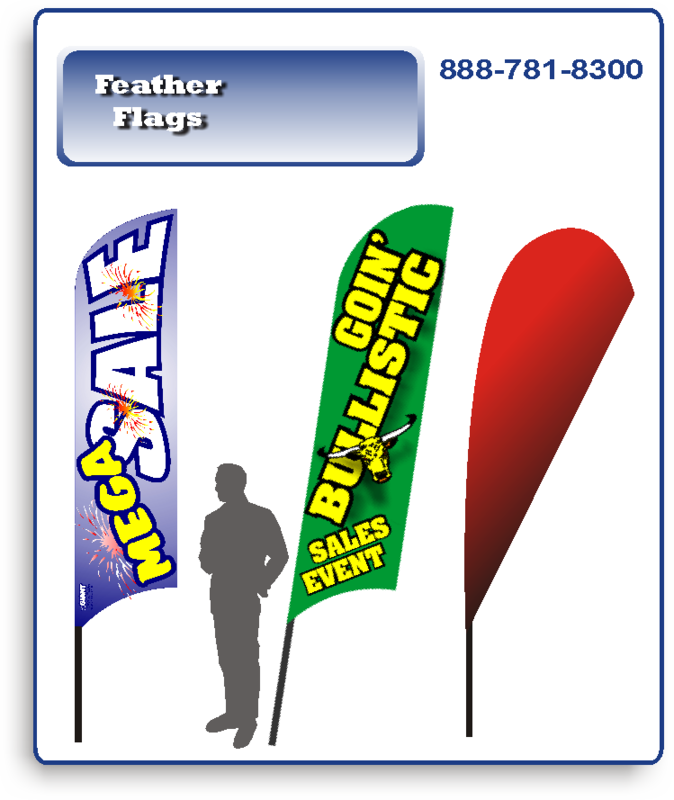 Feather flags, also known as swooper flags, feather banners, bow flags, and teardrop flags, are perhaps the simplest marketing tool available. 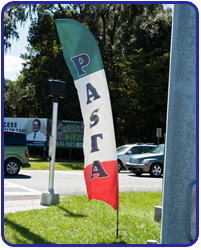 Because of these flags’ simplicity, the overall cost is low, even with custom printing. They are simple in design and easy to use. A feather flag is made of a weather-proof polyester with the option of having it coated with a lamination giving it a sheen. Your flag is made to stand up to sun, wind, rain, and snow for a long time. They can easily be made out of any color, but they are most often made with bright, eye-catching colors to maximize on their attention-grabbing potential. The taller and brighter the flag set-up, the more attention it will draw. 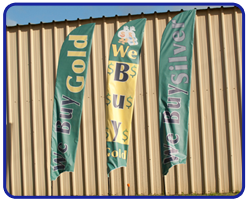 Smaller feather flags work as a great addition to other outdoor advertising products by complimenting business signs and promotional banners without competing or blocking the view of the storefront. 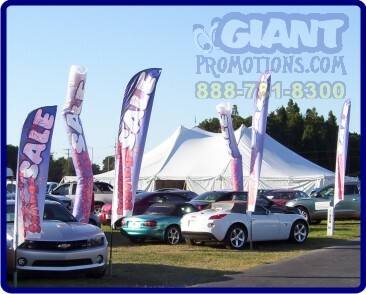 Because of their tall and thin design, feather flags usually work best with a short, simple message printed on them. 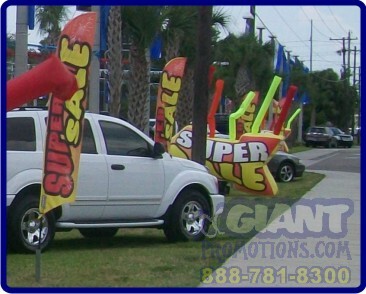 Stock feather flags can be rented with standard messages, such as “Super Sale”, “Mega Sale” and “Grand Opening”. Other messages may be printed with the name of a product the company provides, such as “Flowers”, “Insurance”, or “Car Repair”. This type of message can either be rented or purchased. The initial cost will more than pay for itself as these types of messages will never go out of style as long as the company is open for business, meaning they can be used many times over. 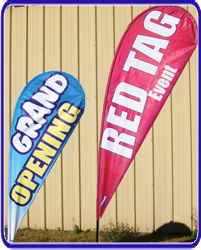 Custom feather flags are also a great addition to any logo branding campaign. 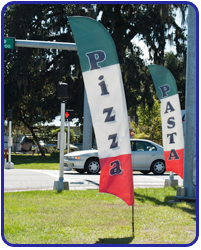 With their low cost, it is not a burden to businesses to order multiple flags with multiple custom printed messages. 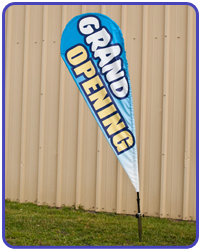 As feather flags are very simple in their design, they are also simple in their installation. These flags, with their tall, thin size means there is practically no weight to support. Feather flags need a pole to be attached to so that the wind can catch them. The poles have several support and grounding options. First, they can be put directly into the ground with the use of a spike. This is often the most secure option for the extremely windy days, however it does require soft ground. Other options include the option for solid surfaces such as asphalt or gravel, by setting up the feather flags with an angled bracket. This option can be made as secure as the first option by adding weight to the angle of the stand on plane with the ground. Common options are sand bags or the wheel of a car. Because of their dimensions, these are also a great option when advertising or highly visible road-side space is limited. These two grounding options as well as multiple others allow for them to be place anywhere at anytime very quickly. Image and first impressions are very important in advertising. 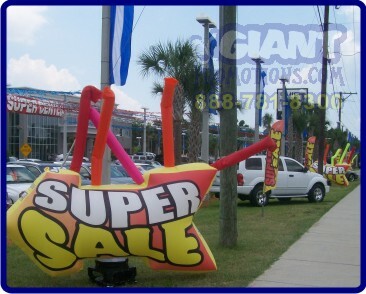 Clean, neat, professional, and quality outdoor advertising is important to every business. However, for companies whose business is image, their advertising needs to be beyond good to absolutely stellar. 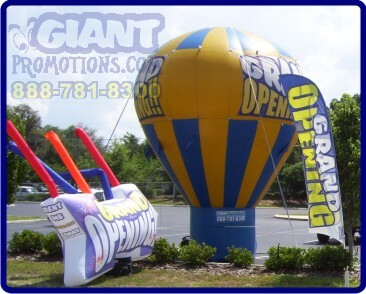 The first step in outdoor advertising is for the business logo and official business sign to be expertly designed and completely unique. These are the permanent fingerprints of a business that need to be prized and on display. After that, all other outdoor advertising is simply “icing on the cake”. 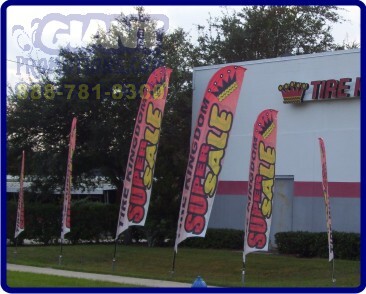 Whether a business is just starting out, or is in need of a marketing make-over, a favorite way of adding to the professional appearance is with the use of swooper flags. These are a favorite because they are simple yet informative, eye-catching but not over-powering, and easy to use without looking cheap. What Should I Put on My Feather Flags? 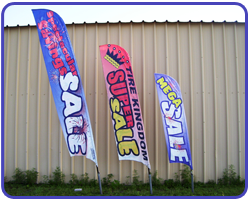 Because feather flags provide a tall and thin space for advertising, it is unusual to see more than one word, service, or product printed each one. 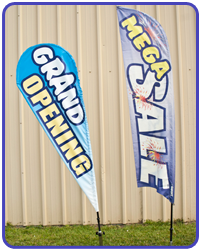 Some popular examples for feather flags used by businesses are “Super Sale”, “Grand Opening” or “Mega Sale”, etc. Advertising the basic products and services are always a good idea, but what is extra important is to market are the unique and unusual products and services offered. The best idea would be to have swoop flags custom printed with those products and services that potential customers cannot find anywhere else. 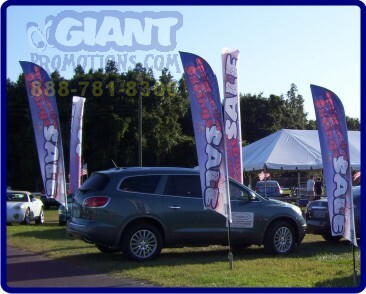 Whether a business is an exclusive provider of a specific product (or at least one that can’t be found for many miles around) or offers more services than other businesses those “extra” offers should be specified by being clearly and proudly displayed on their own individual swooper flag. Our direct service areas cover a portion of Central and North Florida. For locations not located in our delivery areas, we offer a nationwide drop-ship program.